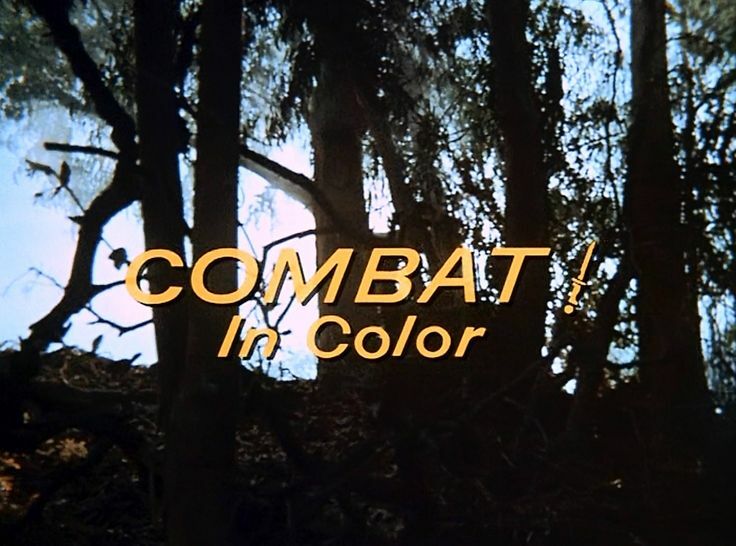 Combat!, a one-hour WWII drama series on television, followed a frontline American infantry squad as they battled their way across Europe. With mud-splattered realism, the show offered character studies of men striving to maintain their own humanity in the midst of a world torn by war. Ah, Season 5. The final season. Most fans, myself included, don’t care much for this season as a whole. Changing from black-and-white to color might have been progress, but so much of Combat!’s tone and mood depended the b&w, and color just didn’t deliver in the same way. There are some great episodes in Season 5, but overall, it’s my least favorite season. In my opinion, there are just too many weird/odd/different episodes that feel like they don’t belong in the show to begin with. And, perhaps, the cast and crew were getting a bit tired of the show, now that it was in its fifth year, which might have contributed to the worn-out feeling of this season. I’m just guessing, but it does seem like a plausible reason. Anyway. On to the review. Main characters: The cast looks good in color. Like, REALLY good. Saunders’ golden-blond hair (I know it’s a cliche, but it is exactly that color), Hanley’s green eyes… I don’t know why it is, but they all look about one hundred percent more amazing in color. That’s pretty much the only good thing about Season 5 being in color. As for the characters themselves, they aren’t much different from the other seasons, which is good – a lot of wonky characterization never improves anything. 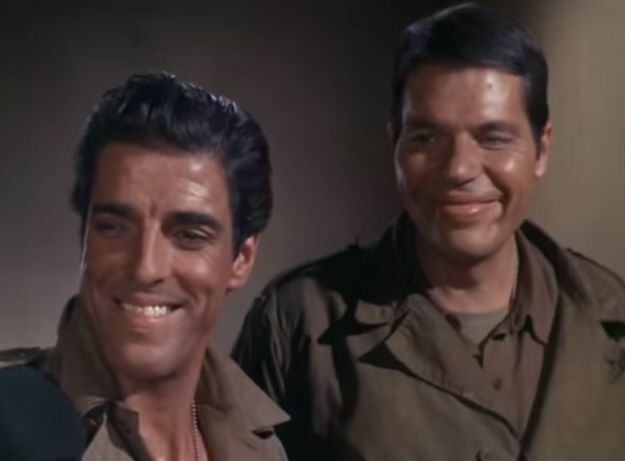 Kirby gets some nice episodes in this one – “The Bankroll” and “The Masquers” are both excellent episodes that highlight different parts of Kirby’s character: his kinder side in “The Bankroll” and his professionalism as a soldier in “The Masquers”. It’s great. Actually, if you think about it, there are quite a few character focus episodes for just about every regular, something that hasn’t happened for a while. Saunders in “The Letter”, “The Furlough”, “The Gantlet”. Hanley in “Entombed”. Doc in “Cry For Help”. Littlejohn in “Gulliver” and “Conflict”. Caje in “Conflict”. Pretty good, huh? I’m satisfied with all the character-driven episodes, the focus each one gets at different times, and that’s about all I want in any season. Now, I’ll admit that sometimes the characterization is iffy, like in “The Letter” – Shirl Hendrix wrote the script for that one, and while he did an amazing job with “Losers Cry Deal” and “S.I.W.”, he really dropped the ball (in my opinion) with both Saunders’ and and Doc’s characters; Doc is too pushy and prying and Saunders is just…wrong all over. On the other hand, “Conflict” shows a much different Caje and Littlejohn, but I think it’s pretty realistic all the same. And Doc gets some stellar moments throughout the whole season, which makes me very happy. Minor characters: One thing that Season 5 has in common with every season before it is the looooong list of awesome/famous guest stars. Goodness, there are so many, and I love it. Sal Mineo, John Williams, Robert Duvall (twice! ), Robert Walker, Jr., Telly Savalas, Claude Akins (again, twice), Nick Adams (who plays a character similar to his one in “Bridgehead”), James MacArthur, and Claudine Longet. Wow. Combat! attracted some famous names, there’s no doubt about that. Aside from the guest stars themselves, though, there are also some characters who I really like. “The Furlough” isn’t one of my favorite episodes, not by a long shot, but John Williams’ character was fun, as always. I’ve seen him in Sabrina, To Catch A Thief, and Dial M For Murder, and he always turns in a great performance, so it was fun to see him in Combat!. 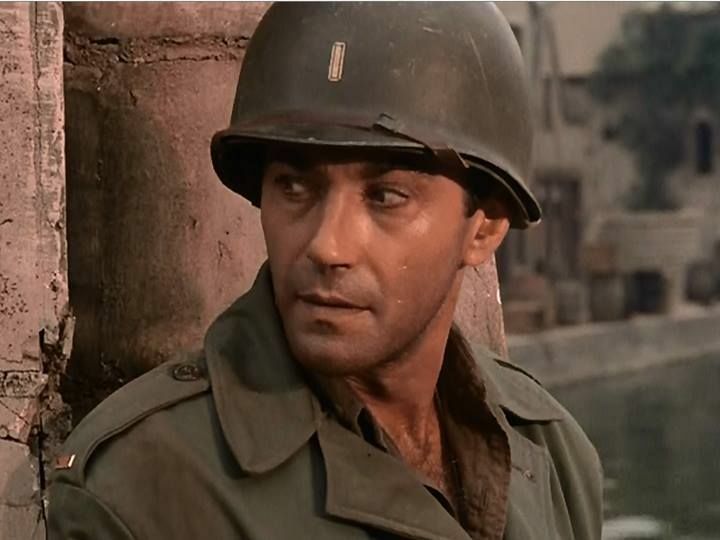 Then, in “Cry For Help”, Robert Duvall as the-medic-who-I-forget-the-name-of was great. It was neat to see Doc and another medic together and the rapport the two of them had. I wasn’t expecting to like Ollie Joe (character and episode both), but I did. When I watched Strangers on the Train a few weeks ago, I kept feeling that I’d seen Robert Walker in something else, but I couldn’t place my finger on where it’d been. One trip to IMDB, and I realized that, though I hadn’t seen him in anything else, I’d seen his son, and they look/sound so much alike that it’s crazy. I also like Claude Akin’s character in “Nightmare on Red Ball Run”, Jeetleman in “The Bankroll”, the British sergeant in “The Masquers”, and James MacArthur’s character in “Encounter”. Oh, and then there’s “Entombed”. I’ll talk about it a little more later on, but, suffice to say, Elisabeth and I love pretty much every minor character in that episode (with the exception of Angsty German Officer). Marianne, and the German guy she falls in love with, Bishop and Wexler, French Resistance dude, etc. And Hanley’s pretty awesome in that one, too. Favorite/Least Favorite episodes: Season 5 is my least watched season, partly because my S5 DVDs have a tendency to jerk up, and partly because so many of the episodes are mediocre, or just plain bad. As always, my opinions on some of these episodes could change in the future, because I’ve only watched them once, but several don’t stand a chance of that, I think. “The Losers” was boring, as was “The Brothers” (plus, there wasn’t enough squad in that one, despite almost all the characters being included in the mission). I reeeally didn’t like “The Furlough” (*gasp from Saunders’ fans everywhere*) because it seemed cheesy and Ann (or Anne) didn’t seem right for him. “Gadjo” was boring (again – it seems like a lot of S5 episodes are dry and have a ‘same old, same old’ quality about them), and I wasn’t impressed with “The Outsider”, “Gulliver”, “The Partisan”, or “Jonah”. And don’t get me started on “The Gantlet”. UGH. That one’s tied with “The Chateau” for my least favorite episode ever. From the above paragraph, you would probably conclude that there are very few, if any, episodes that I truly enjoy in Season 5. But there are some, and the best of S5 does measure up to the standards of previous seasons’ episodes – although the color aspect is still a little distracting. “Conflict” is one of those excellent episodes, something I have to admit, even if I hate the fact that Littlejohn and Caje are about ready to rip each other’s throats out through the whole thing. “Cry For Help” is probably my favorite episode in Season 5, since I’m such a big Doc fan. It might not have the same depth that “The Hostages” does, but it comes quite close and there are many things I like about it. (The battle scene near the end drags on and on, but that’s about the only negative thing I have to say.) It’s great to see Doc getting some quality screen time. As I mentioned earlier, I wasn’t expecting to like “Ollie Joe” much, but I really did. A good, solid episode. “The Bankroll” and “The Masquers” are also great episodes, particularly “The Masquers”, which I view as the second-best infiltrator episode (after “Masquerade”, of course). Combat! has a lot of those, if you think about it. “The Bankroll”, “Encounter”, and “A Little Jazz” are all good as well. But the episode that I really love in this season, besides “Cry For Help”, is “Entombed”. The first time I watched it, I was busy baking brownies, and it’s really hard for me to multi-task, so Elisabeth was filling me in on everything, and I got kind of confused about the plot. It didn’t sound interesting to me, so it took a while for me to re-watch it, but when I did…wow. I loved it. After that, it sort of became ‘our’ episode, and we can’t help but fangirl over the characters and the episode in general. It’s one of those ‘everyone has to work together’ plots which, of course, I love. Annnnd now I need to watch it again. Figures. Overall: Color didn’t do a thing for Combat!. In fact, I think it detracted from the gritty realism of the episodes, and with the move to a new sound-stage and with new directors/writers at the helm of almost every episode, Season 5 didn’t have a whole lot going for it. It just doesn’t hold up well to the brilliance of the earlier seasons. *sigh* I hate to leave this last review on a low note, so I will say that not everything about this season was a loss. There were some great episodes, memorable guest stars, and solid writing. Just not enough to make this season a hit, in my opinion. It’s been great fun reviewing each season and, while these reviews are done, my days of talking about C! are far from over (that’s just a given). I agree on the color thing Eva. Once the show went to color it lost the look and feel of it’s WWII European setting. 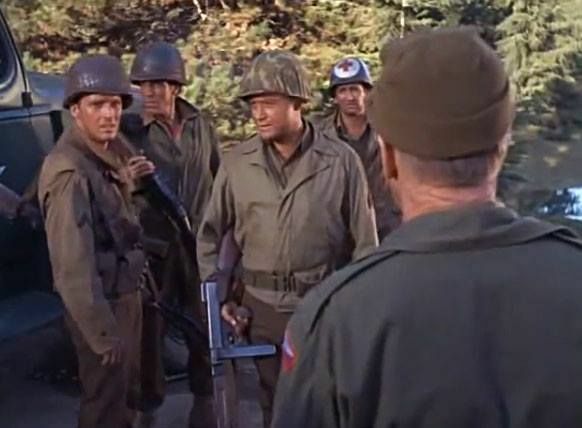 In late 1965 Vic Morrow said: “”I suppose our show will eventually go to color, but I hope not. I prefer the program in black and white. “Combat” is gutsy and raw… and comes across better in stark tones.” And Vic was right. No, I haven’t seen that one before, which is a bit surprising, since I’ve googled C! extensively. 🙂 Very interesting post! 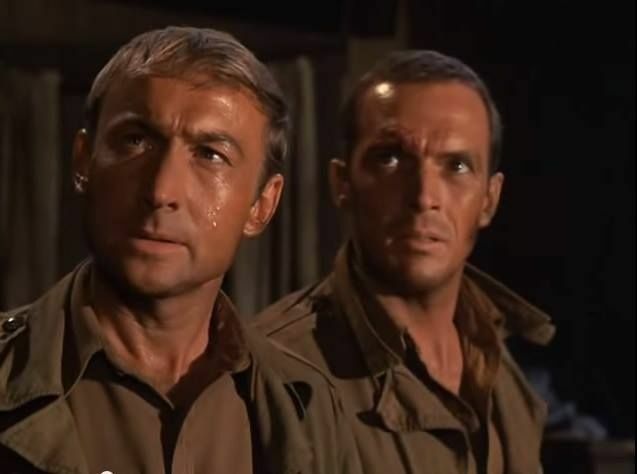 Although I am a deeply devoted Saunders fan, and I sometimes enjoy the feelsy-ness of “The Furlough,” I will readily admit that it’s a far-fetched, imperfectly plotted episode. But I enjoy it nonetheless.